Many studies have suggested that increasing consumption of watermelon can help decrease the risk of obesity and overall mortality, diabetes, and heart disease. Watermelon also promotes healthier complexions and hair, as well as increasing energy levels. One cup of diced watermelon (152 grams) contains 43 calories, 0 grams of fat, 2 grams of sodium, 11 grams of carbohydrate (including 9 grams of sugar and 1 gram of fiber) and 1 gram of fiber. One cup of watermelon will provide 17% of vitamin A, 21% of vitamin C, 2% of iron and 1% of calcium needs for the day. Asthma prevention: The risks for developing asthma are lower in people who consume a high amount of certain nutrients. One of these nutrients is vitamin C, found in abundance in watermelon. Blood pressure: A study published by the American Journal of Hypertension found that watermelon “reduced ankle blood pressure, brachial blood pressure and carotid wave reflection in obese middle-aged adults with prehypertension or stage 1 hypertension”. 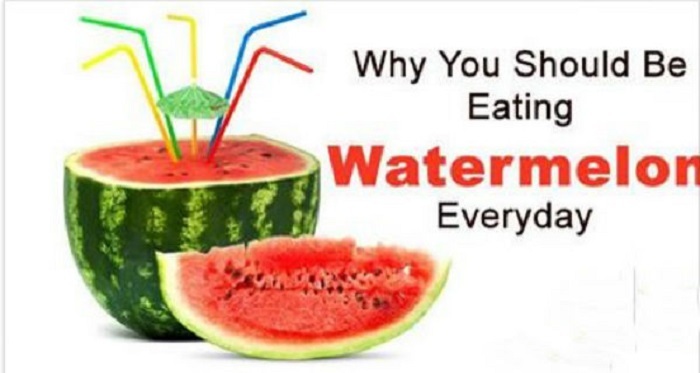 The study also showed that watermelon consumption improved arterial function. Cancer: An excellent source of the antioxidant vitamin C, as well as others, watermelon can help combat the formation of free radicals known to cause cancer. Lycopene intake, for example, has been linked to a decreased risk of prostate cancer prevention in several studies. Digestion and regularity: Watermelon, because of its water and fiber content, helps to prevent constipation and promote regularity for a healthy digestive tract. 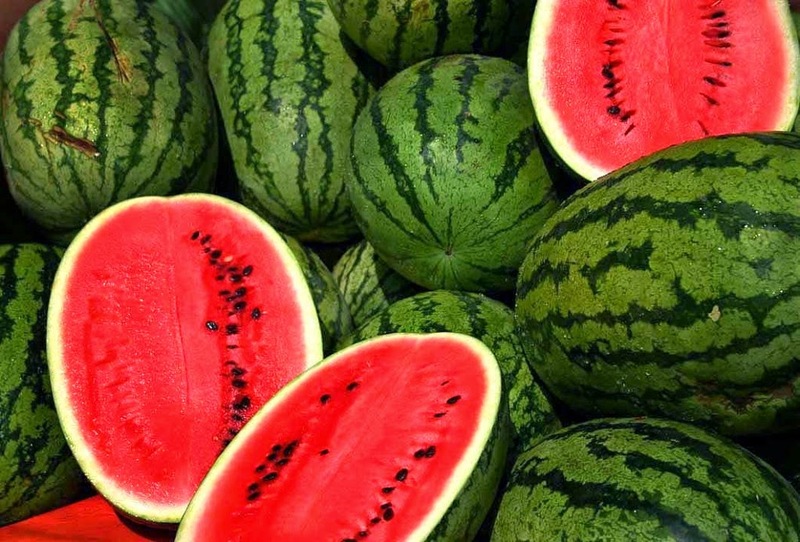 Hydration: Made up of 92% water and full of important electrolytes, watermelons are a great snack to have on hand during the hot summer months to prevent dehydration. Inflammation: Choline is a very important and versatile nutrient that aids in sleep, muscle movement, learning and memory. Choline also helps to maintain the structure of cellular membranes, assists in the transmission of nerve impulses, and helps in the absorption of fat. Choline can also alleviate chronic inflammation. Muscle soreness: Watermelon and its juice have been shown to reduce muscle soreness and improve recovery time following exercise in athletes. Researchers believe this is likely do to the amino acid L-citrulline that watermelon contains. Skin: Watermelon is fantastic for your skin because it contains vitamin A, a nutrient required for sebum production that keeps hair moisturized. Vitamin A is also necessary for the growth of all bodily tissues, including skin and hair. Please remember to choose organic whenever possible!